ISO's predecessors. What are ISO's advantages? Why observe in the infrared? The instruments and their function. How many observations has ISO been performing per day? How many scientific teams have made observations with ISO? Some questions ISO will help to answer. Some of ISO's discoveries so far. The European Space Agency's (ESA) Infrared Space Observatory (ISO) is an astronomical satellite that was operational between November 1995 and May 1998. It operated at wavelengths from 2.5 to 240 microns, in the infrared range of the electromagnetic spectrum. Because the atmosphere acts as an 'umbrella' for most infrared wavelengths -preventing them from reaching the ground- a space telescope is needed to detect this kind of radiation invisible to the human eye and to optical telescopes. Its launch mass was 2400 kg. 2. ISO's predecessors. What are ISO's advantages? 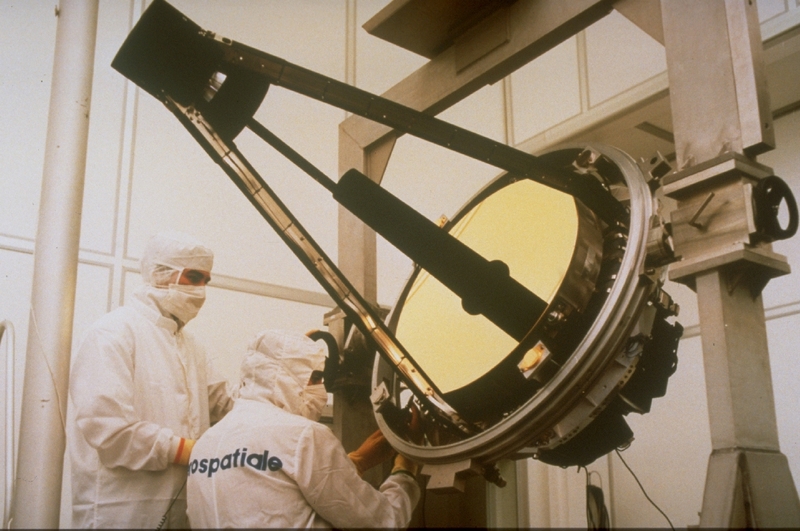 In 1983 the US-Dutch-British IRAS satellite inaugurated infrared space astronomy by mapping 250,000 cosmic infrared sources and large areas of extended emission. But that was only the beginning. ISO's detectors, with an enhanced sensitivity and resolution (by 1000 in sensitivity and by 100 in angular resolution at 12 microns), have allowed a much closer look, a much more detailed perception of the 'infrared scenery'. Thus, ISO has provided astronomers with a unique facility to see both familiar objects in an unusual way and objects that are invisible at other wavelengths. 3. Why observe in the infrared? Infrared radiation is primarily 'heat', or thermal radiation. Even objects that we think of as being very cold, such as an ice cube, emit infrared radiation. For this reason ISO, operating at wavelengths from 2.5 to 240 microns, could observe astronomical objects that remain hidden for optical telescopes, such as cool objects that are unable to emit in visible light. Opaque objects, those surrounded by clouds of dust, are another specialty of ISO because the longer IR wavelengths can penetrate the dust, allowing us to see deeper into such clouds. The scientific instruments were developed by multinational teams, with leaders in France, Germany, the Netherlands and the United Kingdom. The satellite was developed, manufactured, integrated and tested by an industrial consortium made up of 32 companies, mostly from Europe, headed by Aérospatiale, France. The single 0.6-metre telescope in ISO fed infrared beams via a pyramidal mirror to four instruments. The fields of view and the selection of wavelengths are varied, to suit the nature of the object examined. 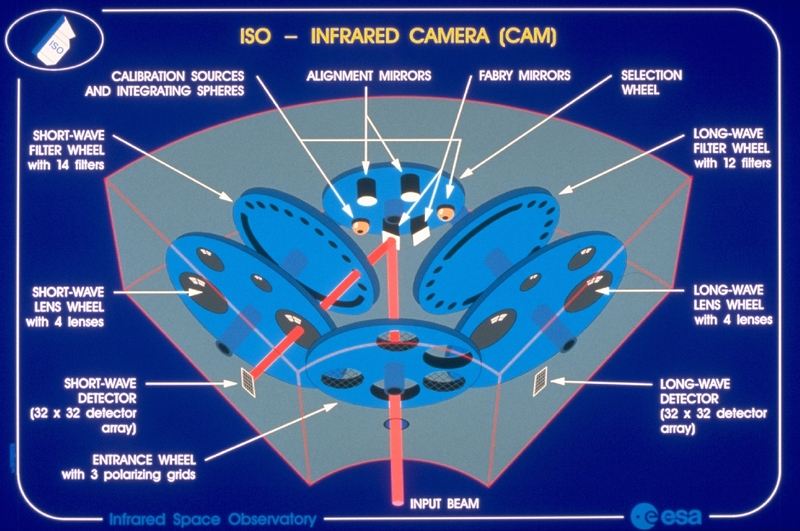 The Infrared Camera (ISOCAM), covering the 2.5-17 micron band with two different detectors. It can be compared to a normal photo camera, taking pictures of the 'infrared face' of astronomical objects at a high resolution (so as to distinguish very fine details). ISOCAM Principal Investigator: Catherine Cesarsky, CEN-SACLAY, France. 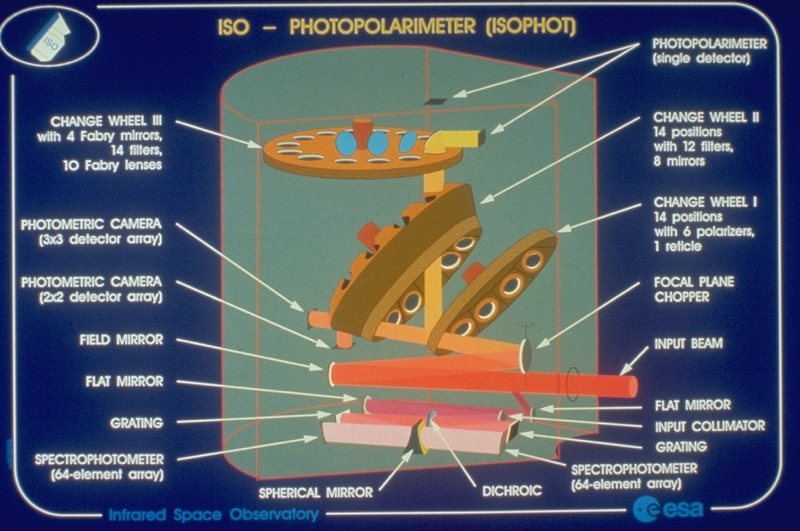 The photo-polarimeter (ISOPHOT), designed to detect the amount of infrared radiation emitted by an astronomical object. The broad range of wavelengths at which ISOPHOT operated (between 2.5 and 240 microns) allowed it to 'see' objects as cool as the clouds of dust lying among stars and galaxies, whose temperature may be just a few degrees above absolute zero (minus 273 degrees C). ISOPHOT Principal Investigator: D. Lemke, MPI für Astronomie, Heidelberg, Germany. 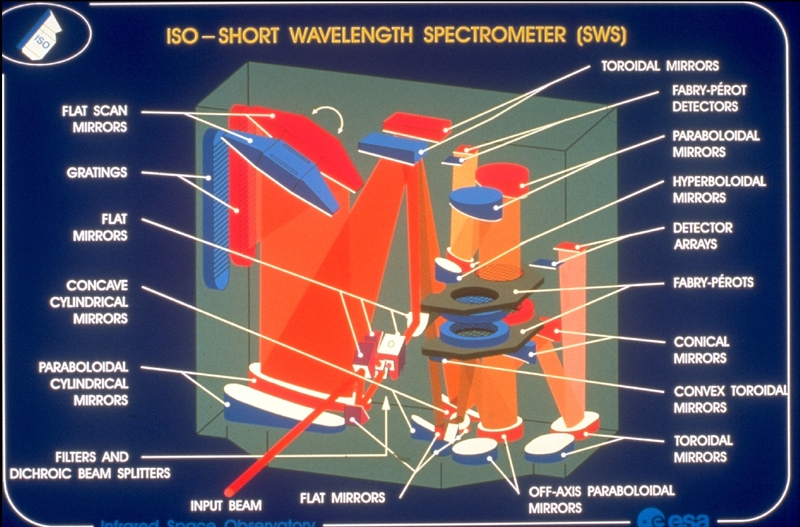 The Short-Wave Spectrometer (SWS), covering the 2.4 to 45 micron band. It has provided valuable information about the little known chemistry of the Universe, since many molecules emit copiously in the infrared. Moreover, SWS has been able to find out the physical conditions of those chemical constituents, such as temperature or density. SWS Principal Investigator: Th. de Graauw, Lab. for Space Research, Groningen, The Netherlands. The Long-Wave Spectrometer (LWS), able to operate at the 45 to 196.8 micron band. LWS has focused on cooler objects than SWS. It is especially useful studying the physical condition in very cold dust clouds in the space between stars. LWS Principal Investigator: P. E. Clegg, Queen Mary and Westfield College, London, United Kingdom. 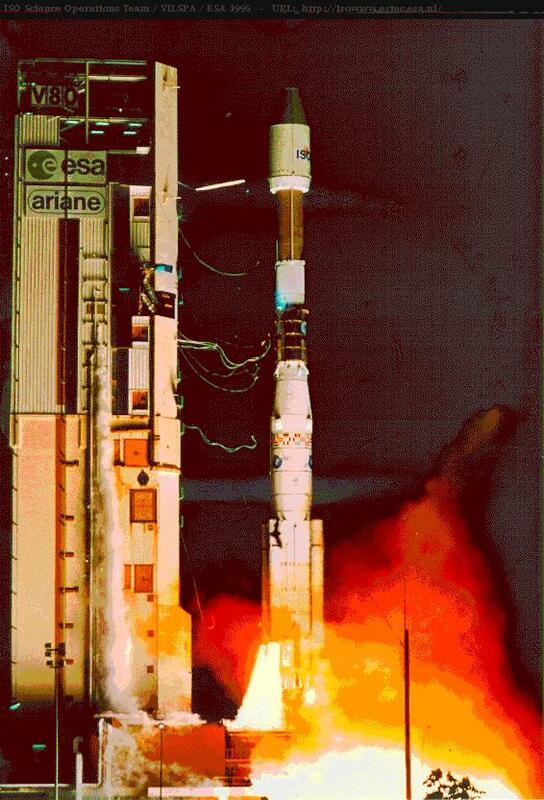 ISO was successfully launched by an Ariane 44P launcher from Europe's spaceport in Kourou, on 17 November 1995. Initially it was supposed to be operational for 20 months, but thanks to meticulous engineering and some good fortune the satellite's working life was stretched to more than 28 months: ISO unveiled the infrared universe until May 1998. Observing the cool universe requires cool instruments, ones working at temperatures close to absolute zero, minus 273 degrees C. Keeping the temperature this low is the task of the large liquid-helium cryostat on board ISO, filled before launch with 2286 litres of superfluid helium. This cryostat has made ISO one of the coolest objects in the universe. ISO's lifetime was limited by its helium supply; hence nearly all observations had to stop when this coolant liquid got depleted on April 8. However, ISO's farewell included a further last gift for the astronomers. A few of the detectors in the Short Wavelength Spectrometer (SWS), one of the four instruments on-board the satellite, could still be used up to May 10, long after the exhaustion of the liquid helium. The Science Operations Centre at the ESA's Satellite Tracking Station at Villafranca (Spain) has been responsible for the control of the satellite. This is also where observations were scheduled. However, for scientific use ISO needed to be in continuous contact with a ground station. NASA's station at Goldstone (US) tracked ISO when it was obscured by the Earth from Villafranca. ISO's highly-elliptical orbit had a perigee at around 1000 km; an apogee at 70500 km; and a period of almost 24 hours. The lowest parts of the orbit lay inside the Earth's van Allen belts of trapped electrons and protons. Inside these regions ISO's detectors were scientifically unusable due to effects caused by radiation impacts. ISO spent almost 17 hours per day outside the radiation belts and during this time all detectors could be operated. 9. How many observations has ISO been performing per day? On average, ISO performed 45 observations per revolution (a period of almost 24 hours). Througout all of its lifetime -more than 900 revolutions- ISO completed successfully well over 26.000 scientific observations. 10. How many scientific teams have made observations with ISO? Astronomers from all over the world asked for observing time on ISO. Their proposals went through a peer review process during which a time allocation commitee composed of independent outstanding scientists decided on the scientific merit of the proposed programmes and observations. Only proposals of the highest quality were accepted. On the whole, about one thousand proposals were accepted (each one consisting on average of 50 observations). Over 500 principal investigators have made observations with ISO. As if stars wished to keep their privacy during these critical stages of their lives, their births and deaths usually occur within thick and opaque clouds of dust (the nebulae). But infrared beams manage to escape these dusty regions, enabling ISO to see them. ISO searched for discs -rings- of matter around stars, which are considered to be the first stage of planet formation -hence they are called 'protoplanetary discs'. When scrutinizing selected objects ISO could detect the emission or absorption of infrared rays at particular wavelengths, or "lines" in a spectrum, revealing the presence of identifiable atoms, molecules and solids. The Short Wavelength Specrometer and the Long Wavelength Spectrometer, along with the photometer ISOPHOT and the camera ISOCAM, provided detailed chemical diagnoses of celestial objects. What are the planets' atmospheres made of? ISO spectrometers have also concentrated on our closest neighbours, the planets in the Solar System. In several cases -such as in the giant planets and even in Mars- the study of the atmospheres' chemical constituents has produced unexpected surprises. Having ISO in space gave astronomers special opportunities for the study of the history of the galaxies. By detecting infrared wavelengths that are hard to observe from the Earth, ISO has picked out very clearly the galaxies that are evolving most rapidly via periods of intensive starmaking, and has been able to detect infrared galaxies powered by active galactic nuclei. ISO has observed many galaxies at about half the age of the Universe by staring through a window in the dust of our own Milky Way Galaxy, called the Lockman Hole. In those galaxies that glow most brightly in the infrared, astronomers suspect that frantic star formation is in progress, in episodes called starbursts. In nearer galaxies, ISO's astronomers can relate strong infrared emissions to collisions and to violent eruptions in the galactic cores, which have punctuated the evolution of the galaxies. The farthest known galaxy observed by ISO is a quasar called BR 1202-0725, dating from a time when the Universe was less than one-tenth of its present age. Already it is dusty, indicating star birth and death has occured by this early stage. What is a comet made of and how does it behave on approaching the sun? The infrared wavelength region is useful for investigating comets because they are cold -the thermal emission of the comet nucleus and dusty atmosphere peaks at infrared wavelengths. In this emission region the chemical composition of the comet can be studied: the volatile molecular species, sublimated from cometary nucleus ices, can be identified through their fundamental bands of vibration, and are therefore the subject for high resolution spectroscopic observations. Infrared observations from the ground are limited to a few atmospheric windows, and this is an annoying restriction for investigating changes in the comet on its approaching to the sun. IR spectra of comets have been obtained for Comet Halley, but they were limited in spectral coverage, resolution or both. Many of ISO's discoveries haven't come out yet because they are still being processed by the researchers. These are some of the results published so far. For up-to-date information please refer to ISO's Homepage on the Web. (URL: http://www.cosmos.esa.int/web/iso). Because of the Earth's atmosphere acting as an opaque screen, only with ISO have astronomers been able to study the chemistry of the Universe in detail. One of the most mind-boggling discoveries they've made is that there's a lot of water vapor in the universe. Indeed, ISO's found the telltale signature of water in starforming regions; in the vicinity of stars at the end of their lives; in sources very close to the galactic centre; in the atmospheres of planets in the Solar System. On the whole, scientists estimate the total amount of water in our own galaxy to be millions of times the mass of the Sun. There is gaseous water, for instance, in the upper atmospheres of the giant planets. On average, Jupiter, Saturn and Uranus are showered by 10 kilograms of water per second. The problem is scientists do not know where does this water vapour come from. Maybe from deeper in the planetary atmospheres? This is not very likely because water vapour coming from -say- evaporating oceans would freeze into clouds when reaching the cold outer parts of the atmospheres, a very common process here on Earth. An outside source -maybe tiny frozen comet nuclei pummelling on the atmospheres- is therefore a much more likely explanation. The detection of water vapour on Titan's atmosphere -Saturn's biggest moon, where the NASA-ESA mission Cassini-Huygens is now headed- will surely help to solve the problem mentioned above. Scientists will now be able to better understand the chemical processes taking place in this cold moon, maybe only just too cold to bear life. Astronomers using ISO have also found water vapor in the Orion Nebula. Actually, they've detected by far a larger amount of water than that previously measured in other interstellar clouds. Scientists knew water vapour was present in clouds close to starforming regions -like the Orion Nebula- but they have no explanation yet as to why there should be such an enormous concentration of water vapour there. They say the "huge chemical factory" observed in Orion generates "enough water molecules in a single day to fill the Earths's oceans sixty times over." This discovery may have also implications for the origin of water in the Solar System and on the Earth itself, and models explaining the evolution of molecular clouds where stars are born will surely have to be revised. Astronomers at the universities of Amsterdam, Louvain, Groningen and Utrecht have found proof that planets can form around old, dying stars. In the vicinity of the Red Rectangle, an old binary star in the Monoceros constellation, they have detected a ring of matter constituting the first stage of planet formation. Their results were published in Nature on 26 February 1998. It had previously been assumed that planets can form only round new-born stars. Click here for images and a more detailed description of the result. A team of astronomers from the United States and Germany discovered trace amounts of hydrogen fluoride gas in the near vacuum of interstellar space. Although approximately one hundred different kinds of molecules have been detected in interstellar space over the past 30 years, the discovery of hydrogen fluoride marks the first time that a molecule containing fluorine has been detected in an interstellar gas cloud. The discovery was reported in the Astrophysical Journal Letters. The astronomers searched for hydrogen fluoride molecules within a giant cloud of interstellar gas located near the centre of the Milky Way galaxy. 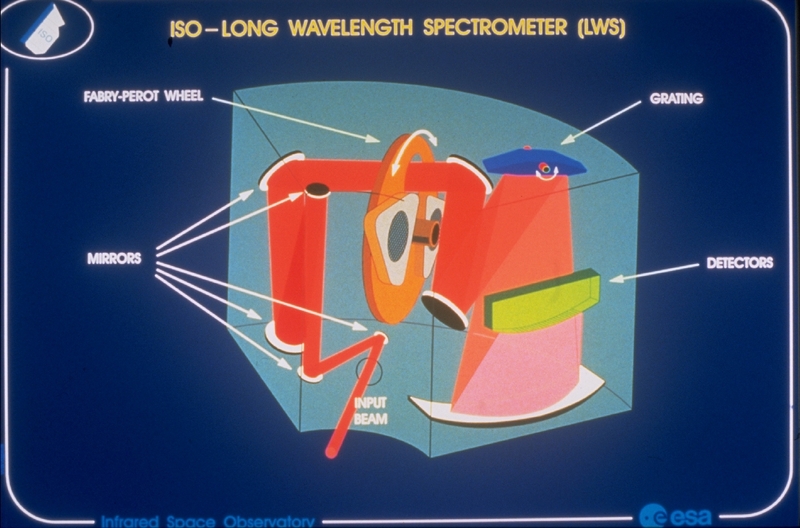 The new observations were carried out with the Long Wavelength Spectrometer, one of four instruments on board ISO. Looking in the far-infrared region of the electromagnetic spectrum, the astronomers observed the telltale signature of absorption by trace amounts of hydrogen fluoride gas. The remnant of a supernova remains discernible for thousands of years after the explosion. The most recent supernova observed in the Milky Way Galaxy occurred little more than 300 years ago and the resulting nebulous object is called Cassiopeia A. ISO has made the first detailed examination of Cassiopeia A by infrared rays unobservable from the Earth's surface. It gives direct evidence of dust formation. One prize sought by ISO astronomers has been the detection of the earliest stages of star formation. Pre-stellar cores are egg-like objects hidden within a larger dust cloud. A cold, thick shell of dust obscures the interior, where gas collapses under gravity to make an embryonic star. By the time the dust has dispersed, and the object inside has hatched as a plainly visible star, the main event of star formation is complete. In the earliest stages, only radio waves and far-infrared rays can escape from the dust cloud, allowing us to observe the real origins of the stars. Derek Ward-Thompson of the Royal Observatory Edinburgh (UK) and his colleagues at Cambridge University and in France, first detected the pre-stellar core L1689B, using observations at sub-millimetre radio wavelengths, in the constellation Ophiuchus. It is a very young pre-stellar core, on the brink of collapsing to form a new star. Now the team has used ISO to make the first infrared images of L1689B using the photometer ISOPHOT at long infrared wavelengths, up to its limit of 240 microns. The shell of dust is so cold, at roughly minus 260 degrees Centigrade (or 13 K), it is undetectable even at short or medium infrared wavelengths. Astronomers can now combine ISO's results with observations of the same object and others like it, at sub-millimetre radio wavelengths, to build up a detailed picture of the earliest stages of star formation. ESA's Infrared Space Observatory ISO has detected dust for the first time in the apparently empty space between the galaxies. German and Finnish astronomers made the discovery in the northern constellation of Coma Berenices, where more than 500 galaxies swarm together in the Coma Cluster. The intergalactic dust is concentrated towards the centre of the cluster. In the past, astronomers have considered intergalactic space to be extremely clean. Except in the vast concentrations of stars, gas and dust that make up the galaxies themselves, the Universe was supposed to be filled only by very thin traces of invisible gas. ISO's detection of dust means that the Universe is less transparent than astronomers have assumed. Their cosmic window-pane is slightly dirty and large-scale inferences based on the brightnesses of distant galaxies and quasars may be affected. The discovery of Comet Hale-Bopp occurred before ISO's launch in November 1995. When first observed by ISO in March and April 1996, the comet was still 700 million kilometres from the Sun, and almost as far from the Earth and ISO. With its privileged view of infrared wavebands inaccessible from the Earth's surface, ISO's spectrometer in ISOPHOT discovered that carbon dioxide was an important constituent of the comet's emissions of vapour. ISOPHOT measured the temperature of the dust cloud around Comet Hale-Bopp. In March 1996, when the comet was still more than 700 million kilometres from the Sun, the dust cloud was at minus 120 degrees C. When ISOPHOT made similar observations in October 1996, the comet was 420 million kilometres from the Sun, and the dust cloud had warmed to about minus 50 degrees C.
Click here for more detailed description of the result. Observations with ISO have revealed that the most famous of the enigmatic ultraluminous infrared galaxies (Arp220) is powered by an outburst of star formation, not by a central black hole. The same is true for all but one similar galaxies observed so far. Ultraluminous infrared galaxies (ULIRGs), the most luminous objects in the local universe, were detected in the 1980s by their prodigious emission of infrared radiation, but the origin of their enormous luminosities has yet remained unclear. The hopes of many astronomers were hence put on ISO, which allowed to study in unprecedented detail the infrared radiation, having wavelengths longer than visible light. Collisions between galaxies, each containing billions of stars, are the biggest events since the origin of the Universe. They may occur often enough to play a major role in the evolution of galaxies, and they provide a major theme for ISO's research teams. Collisions trigger star formation within dense dust clouds. These are opaque to visible light, so that even the Hubble Space Telescope is blind to the events within them. One target for ISO's Camera was a pair of galaxies known as the Antennae, 60 million light-years away. The name comes from antenna-like streamers of stars torn from the galaxies by a collision. The galaxies look quite similar by visible light. With its ability to harvest and analyse infrared rays, ISO distinguishes between the different kinds of commotion provoked by the encounter. The Long-Wavelength Spectrometer covered a range of the infrared spectrum entirely blotted out by the Earth's atmosphere. Instruments in high-flying aircraft and balloons have glimpsed some features in the sky at long infrared wavelengths, but only ISO offered a clear view. As a result the Long-Wavelength Spectrometer has been able to observe, in a wide variety of cosmic settings, radiation that plays an important part in cooling the Milky Way Galaxy. Emission at a wavelength of 158 microns (about a sixth of millimetre) come from ionized carbon atoms in the clouds that fill the spaces between stars. The Long-Wavelength Spectrometer has picked up the emissions from a region where stars are being born, from a dying star, from warm and cool clouds of dust and gas, and even from extremely cold clouds of hydrocarbons called infrared cirrus. Although completely invisible to the eye, the energy shed in this way may be equivalent to the light of a billion stars. It affects the energy budget - and therefore the temperature - of the Milky Way, and of other galaxies too. ISO was switched off on May 16 at 14:00h (CET), thereby bringing to a close the highly-successful in-orbit operations of the ISO mission. 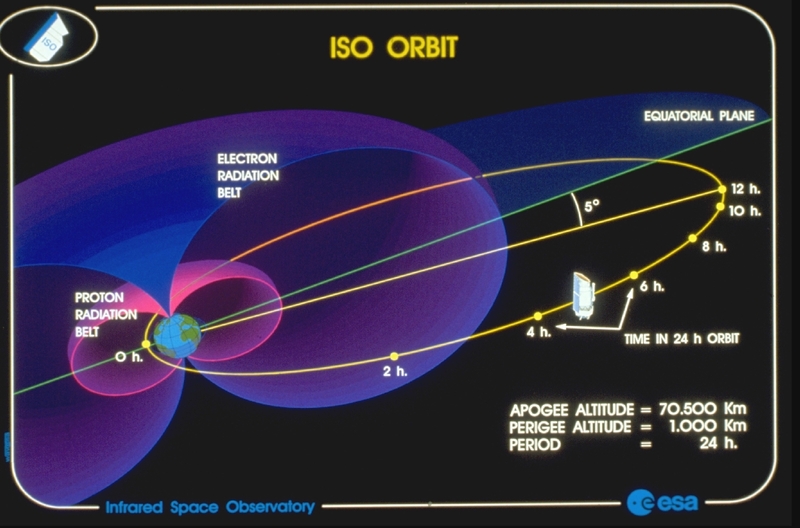 Prior to that, ISO's orbit was changed to force the satellite to burn up in the atmosphere, thus contributing to preserving the environment in space. In the Post-operations Phase, running until end 2001, ESA's ISO Data Centre developed and refined the ISO Data Archive to offer the ISO data to the worldwide astronomical community, and together with the several National Data Centres in various member states and in the US (listed below) worked to fill the archive with the best systematically processed and calibrated data products which could be achieved for the huge ISO database. ISO's Legacy Archive, containing this reference product set, was released at the end of February 2002. During ISO's Active Archive Phase, which runs from January 2002 to December 2006, the ISO Data Centre continues to work with active National Data Centres in The Netherlands, Germany and the U.K. to support the community in its use of the ISO data and to capture back into the archive as much as possible of the user knowledge so as to maximize the long-term value and usability of the archive. More often than not, the number of questions a scientific mission solves is not as good an indicator of its success as the number of new questions it generates. And ISO has been a successful mission from every point of view: no doubt more space telescopes are needed to do more infrared astronomy. The NASA's infrared space telescope called Spitzer Space Telescope (formely known as SIRTF) was launched into space by a Delta rocket from Cape Canaveral, Florida on 25 August 2003. 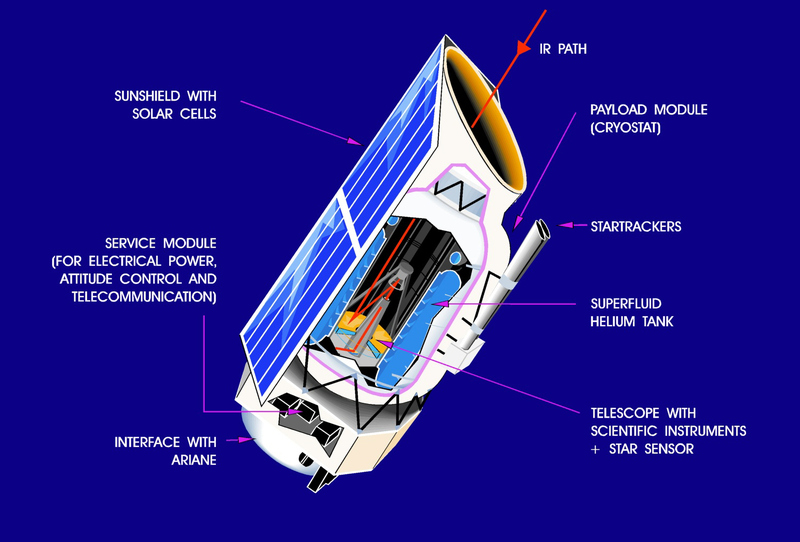 Further ahead in time ESA is preparing the Herschel mission (formerly known as FIRST), a space telescope for far infrared and submillimetre astronomy due to be launched in 2007.